Following on from our introductory “A conversation around what it means to be a digital university” post, we are now going to start to look in more detail at the matrix we introduced. We believe that these four high level headings are key for strategic conceptualization for a 21st Century University. Below is the expanded matrix. The logic of our discussion starts with the macro concept of Digital Participation which provides the wider societal backdrop to educational development. 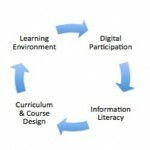 Information Literacy enables digital participation and in educational institutions is supported by Learning Environments which are themselves constantly evolving. All of this has significant implications for Curriculum and Course Design. We see educational development as the primary channel to unite the elements of our conceptualisation. Over the coming weeks, we will expand on each of the four quadrants, starting with this post which focuses on Digital Participation. We have used the term digital participation, as we feel that it is a more inclusive term than digital literacy. Digital participation is a broader social construct with varied implications for educators. As we pointed out in our previous post the term digital literacy currently lacks a clear consensus of opinion. It could be interpreted as almost anything to do with ‘the digital’ and this may lead to the cognoscenti having widely different views, albeit tightly understood amongst themselves, from the more numerous members of the population, who don’t have such a professional interest. 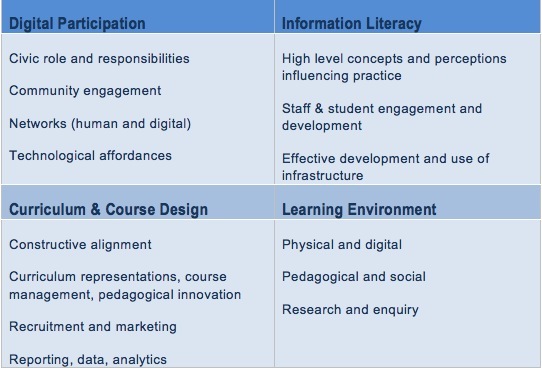 This issue arose at the start up meeting of the JISC Developing Digital Literacies Programme, where there was recognition that the definition of digital literacy used in the programme may not be commonplace in HE and indeed with the strategic partners for the programme. In the UK, both the Westminster and the Scottish Governments are recognising and encouraging digital participation across all sectors of society and emphasising the notion of the “digital citizen” e.g. increasing use of web-based consultation exercises, increased moves towards the notion of Open Government. Digital participation, in this context, can be seen as a fundamental part of any knowledge economy or information based democracy and therefore has substantial implications for educators. Digital participation needs to be optimized to ensure continued economic growth in parallel with the development of an informed, literate citizenship. Universities (and indeed the whole education sector) are uniquely placed to lead and evolve this kind of participation for and with their wider communities. However there are problems with this scenario in that digital ‘coverage’ of the population is patchy, organizations are still finding their way with digital realities. Rapid changes in technology are forcing universities to make decisions based often on purely technological grounds, or delaying decisions for the same reason. It is these issues, particularly related to HE, that our conceptual matrix seeks to address by providing a holistic tool with which to question strategic planning and institutional provision and development. •	Civic role and responsibilities – how does access to digital resources underpin civic action? •	Community engagement – how can we facilitate more and better engagement between communities? •	Networks (human and digital) – what networks do we need foster? •	Technological affordances – what are the underlying infrastructures and connections underpinning access to all of the above? Of course, digital participation hinges on information literacy, which will be the focus of our next post. But in the meantime, what do you think? Have we identified the key concepts around digital participation? This entry was posted in curriculum design, learning opportunities and tagged jiscdiglit. Bookmark the permalink. This may seem a little strange coming from me – champion, as I am, of all things digital – but I think the Digital Participation element should ‘lose’ the ‘digital’. Not that I don’t think digital participation is needed – I do. But we also need to continue to encourage and develop ‘good old fashioned’ Participation. Interesting point, yes you’re right we mustn’t forget the non digital aspects of society and education. Hi Pat and Sheila, yes, I would agree. The thing about participation nowadays is that environments are being designed to engage students in ways that are situated, connected and realised through digital immersion…..although I am all for ensuring that quiet (non-techno connected) thinking spaces are part of engagement and where the device is prised away from brain! Agree with your comment Pat. Look forward to developing this aspect with you and others.